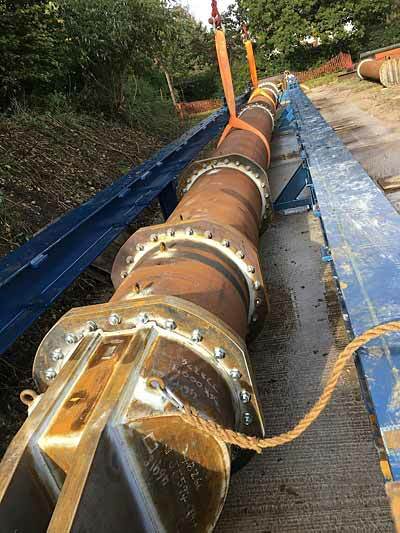 Modulift has manufactured its largest ever spreader beam that can lift a staggering 1,500 tonnes at a span of 20 metres. The feat of below-the-hook engineering was delivered to Holland-based Safe Lifting Europe B.V, a sister company of Euro Rope Nederland B.V. and an equipment / service provider to the marine industry, at the end of last year. The MOD 800X/1500 has 1,000 t/800 t, top/bottom wide body shackles at each end and is the second 1,000-t+ spreader beam Modulift has manufactured in less than three months, as the super heavy lift sector continues to demand higher capacity equipment. The latest beam received DNV Design Approval and DNV GL CG3 certification; the latter certifies that DNV carried out a full survey during the manufacturing and testing process, as well as approving the design. The beam took eight weeks to manufacture and test in a purpose-built compression test rig. The rig had to be upgraded so Modulift could apply a proof load of 1,650 t (working load limit [WLL] x 1.1) to the spreader beam. Spencer explains that this particular customer observes that marine influencers are increasingly looking for modular solutions to upscale lifting activities on topsides, in particular to avoid limitations associated with fixed systems. She also anticipates that the 800X/1500 beam will not be the company’s largest spreader for long, with the market showing an insatiable appetite to continue to upscale lifting capacities. Further testimony to the potential of the marketplace is the fact that the hulking beam was not acquired for one standout job, but for repeated use alongside other Modulift equipment, ranging from MOD 110 to MOD 600XB/800. Winches, spoolers, water bags, load cells, shackles and other rigging equipment are also widely utilised by its customer base.